Philly's 30th Street among the most expensive streets in U.S. It's no secret that the area along 30th Street between Walnut and Arch streets is booming of late. It's also become one of the priciest strips for office space in the U.S., a recent JLL report shows. Noting the average rent price of $48.30 per square foot along 30th Street between Walnut and Arch streets, the biennial report ranked the corridor as the 16th-most expensive street in the country. The study, which shows where office tenants pay the most for their workspace nationwide, mentioned that the recent completion of the FMC Tower "has cemented University City as one of the most desirable office locations in the region’s core." The street is now the most expensive in the city, and the 83.9 percent premium on the corridor is only expected to climb with the $3.5 billion Schuylkill Yards project, which broke ground this fall. Vacancy on the strip is at just 7.1 percent, the firm added. The 49-story FMC Tower at Cira Centre South houses the headquarters of specialty chemical company FMC Corporation and includes a vertically stacked combination of office space, retail and residential units. The 730-foot-tall skyscraper will be part of the Schuylkill Yards development, which will be completed in phases over a period of roughly 20 years. 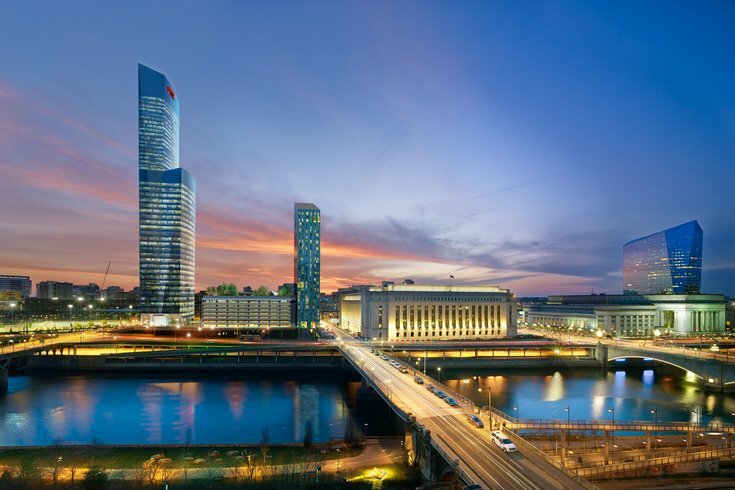 Planned in a partnership between Drexel University and developer Brandywine Realty Trust, the project aims to turn the corridor along the Schuylkill into an innovation hub with several new skyscrapers. Average rents along 30th Street still pale in comparison to San Fransisco's Sand Hill Road ($119.38) and New York City's Fifth Avenue ($116.04), the clear frontrunners in that category.